Find yourself finally booking that adventure to Saint Petersburg, Russia? 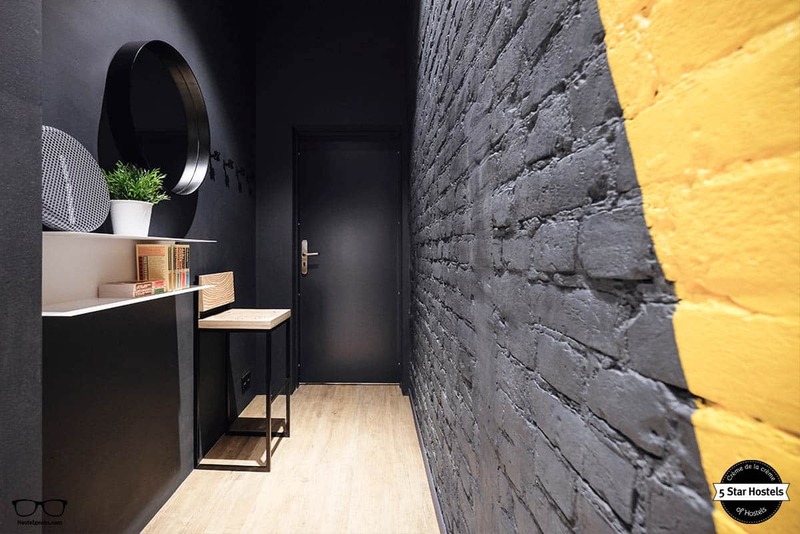 Excellent, now let us introduce you to the inBox Capsule Hotel; the 5 Star Hostel in the city centre of vibrant Saint Petersburg. 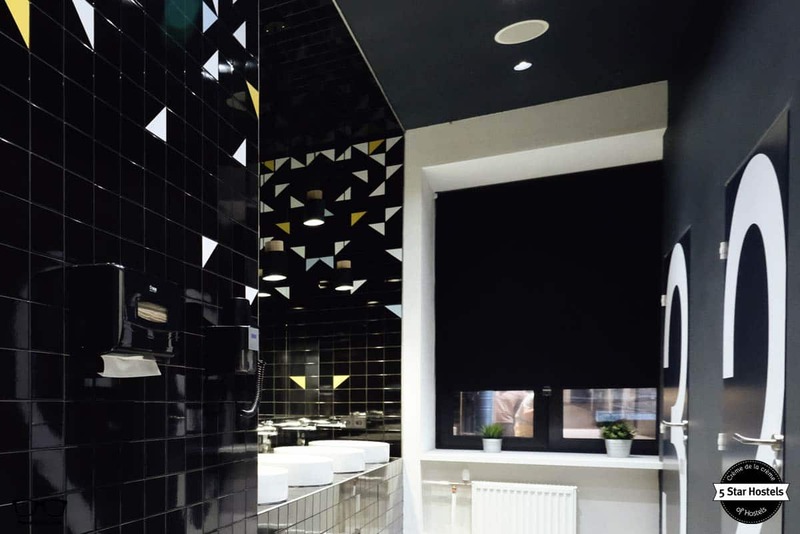 If you’re looking for unique, modern design and cosy, personal space, this is the hostel for you. A visit by Hostelgeeks. How to book inBox Capsule Hotel? 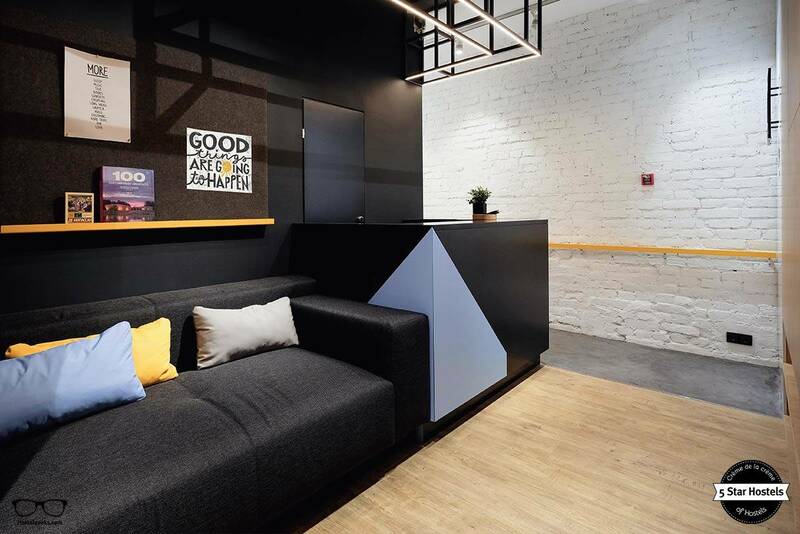 Congrats, you just found the coolest hostel in Saint-Petersburg, Russia. Now, what about your booking? Check out the official website of inBox Capsule Hotel. Why? There you can get the lowest prices! Good to know: Booking the 5 Star Hostels on their official website is the cheapest and safest place to book. In a nutshell, inBox Capsule Hotel is centrally located. Moskovsky train station is a 10 minute drive to the hostel. Gostiny Dvor metro station is also close by – just a 17 minute walk. 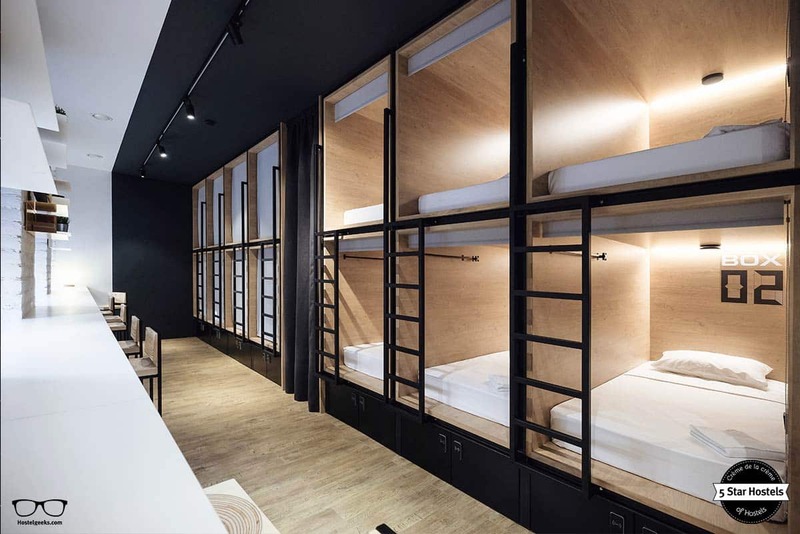 inBox Capsule Hotel is described by the staff themselves as “a hostel for young individualists”, this “hostel for introverts” is the perfect place for those of you that cherish your own space. Check out the capsule beds – everything you need to be comfortable in one small space, with the added bonus of an in- room social area. And here is a spoiler from point#3: each capsule has its very own ventilator and A/C. The A/C is centrally operated, so it’s cosy and warm for every capsule. 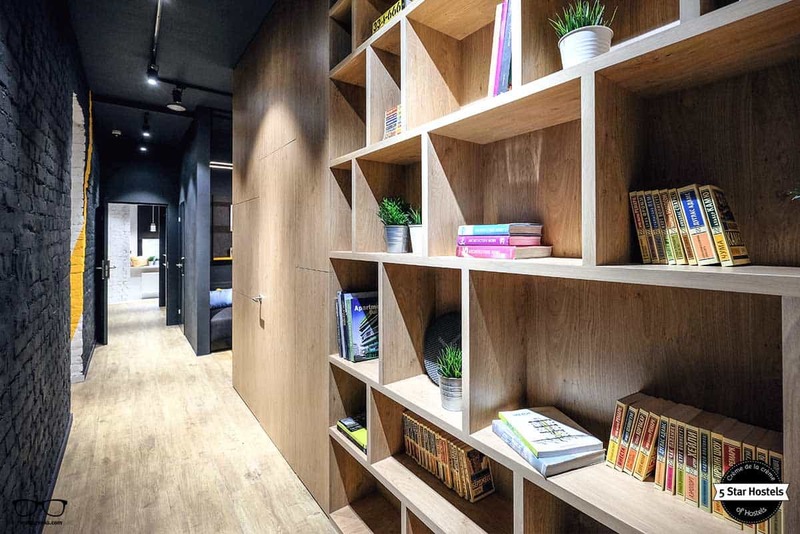 The 5 Star Hostels, including inBox Capsule Hotel, are awarded by Hostelgeeks, an independent platform designed to deliver the world’s greatest hostels. It’s true that inBox Capsule Hotel is ‘better than a hostel, cheaper than a hotel’, but don’t take our word for it. Let’s take you through step by step, and explain just why this super cool, super sleek hostel has made it on to the 5 Star Hostel list. 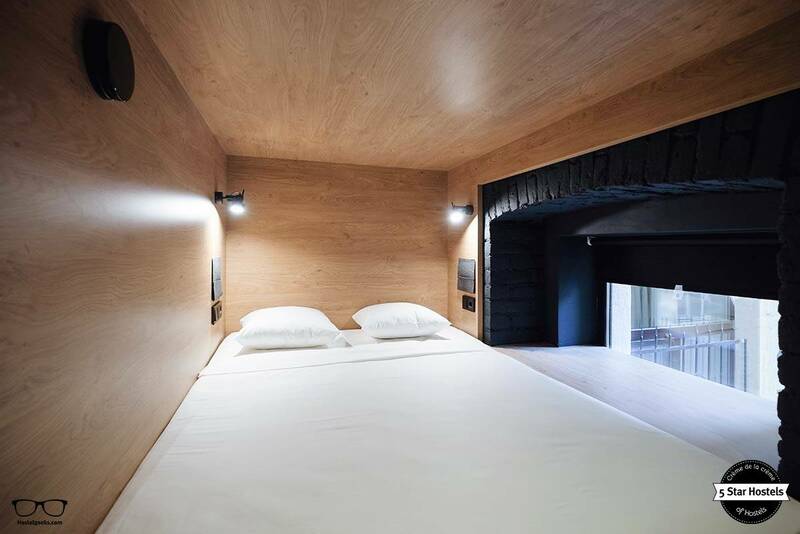 Let’s kick-start our tour of inBox Capsule Hotel by looking at their eco-friendly efforts: During the development of this quirky hostel, the owners were very keen to comply with the principles of a eco-friendly accommodation. In fact, the concept of the hostel was designed around this. As you wander around and make yourself comfortable, you will notice lots of little efforts that go a long way. The lighting for instance is 100% LED – very important when you have lots of travelers flicking switches throughout the day and night, because you can! Each dorm bed has its personal reading light, and with the added bonus of a curtain, you won’t need to worry about disturbing your room-mates any more. And whilst you are enjoying the privacy of your bed, check out the sheets and towels; they are 100% organic cotton and 100% cosy. Make your way to the shared bathroom and you will notice the water saving sensor faucets. This doesn’t mean your shower will be cut short, but it will prevent water wastage. inBox Capsule Hotel is not only eco-minded, but generous also. Never fear if you forgot your personal amenities; soap and shampoo dispensers are available in all of the showers. Another perfect way to reduce waste! And one item less to carry on! We elaborated an article about what not to pack to stay at a hostel. For your personal health, only non-toxic cleansers and detergents are used in housekeeping. 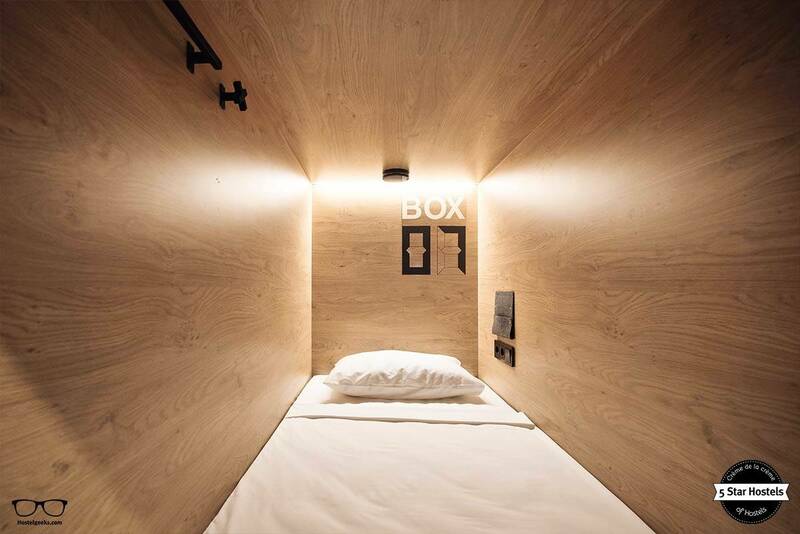 The inBox Capsule Hotel is also strictly a non-smoking premise. 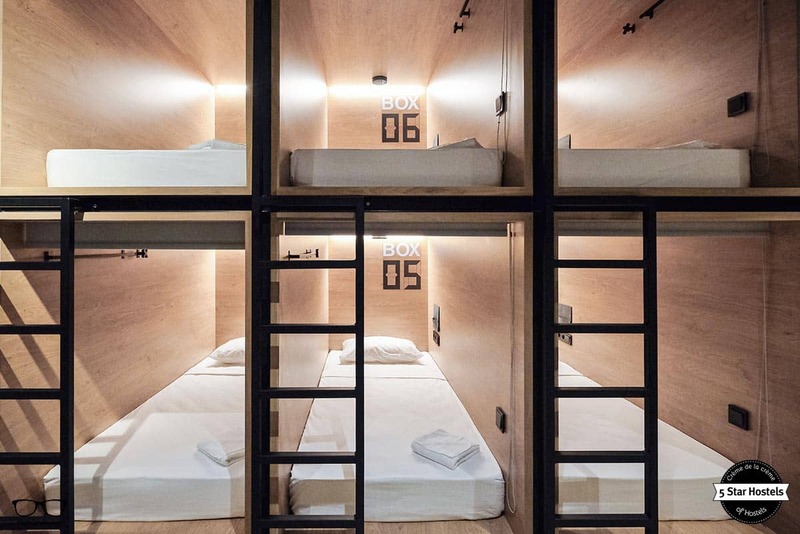 As we mentioned in the introduction, inBox Capsule Hotel declares itself to be „better than a hostel, cheaper than a hotel“, and this is largely based on its design. The overall design was developed by a professional architectural studio, and they were set an important task during this process. 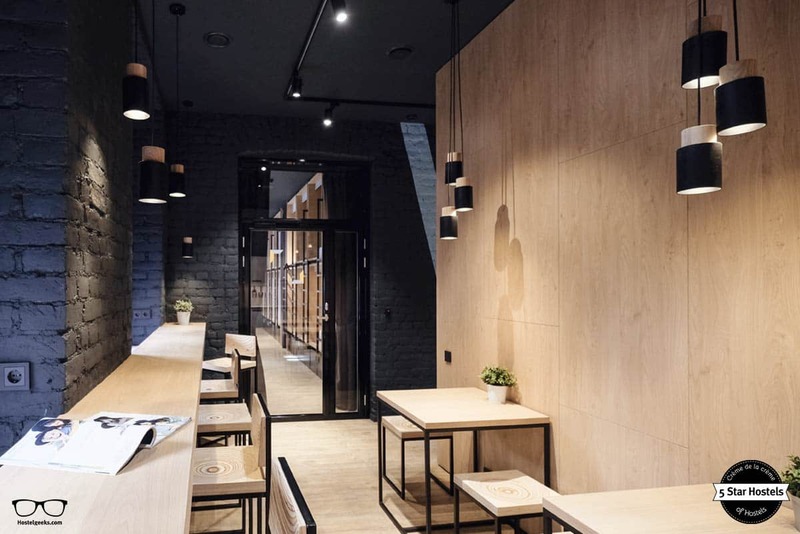 The owners wanted interior creations to follow the concept of „a hotel for young individualists“. We here at Hostelgeeks think they did a great job! Have a look at the rooms to see what we mean – although shared, each bed is completely private and individual – perfect for introverts that love their own space, but enjoy the option of mingling with others. 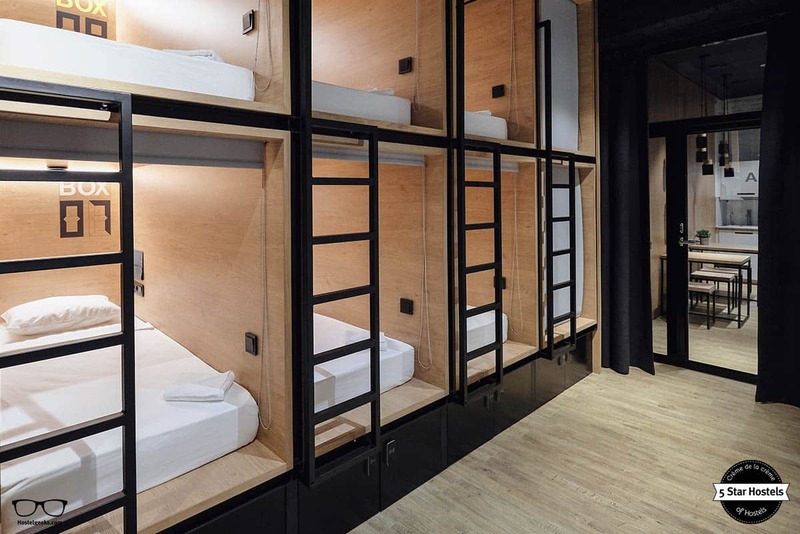 The name of the hostel is also pretty cool – inBox Capsule Hotel. 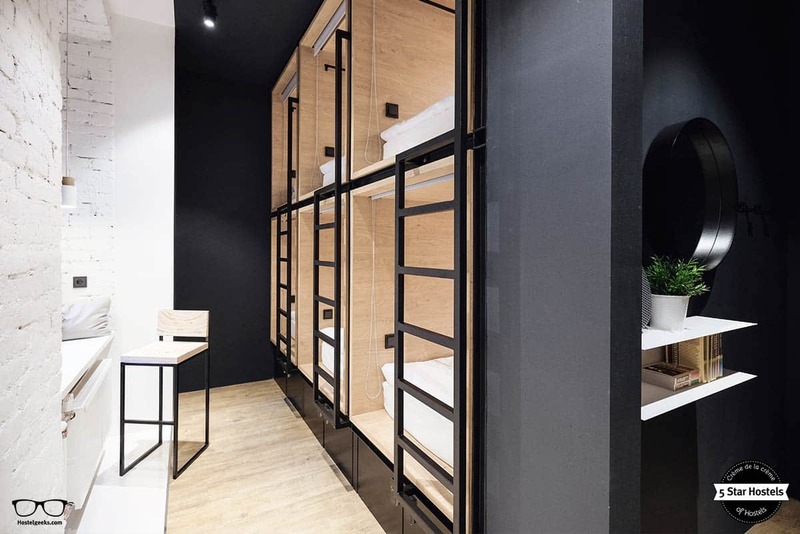 As the beds are designed to look and feel like a personal capsule, surrounded by four walls to replicate a box, you will quite literally be staying in-a- box! What a clever name indeed. 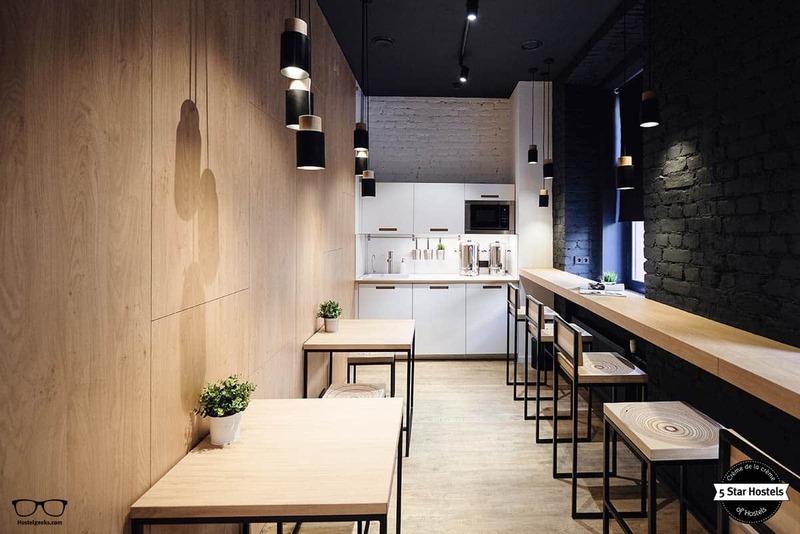 To support the box like feel, modern black-white-wood interiors have been included, with a small number of details added in. When we first clapped eyes on the interior of this hostel, we were intrigued. Where else have you seen this type of design? Compact, modern, private and a seriously clever use of space. It isn’t very often you find shared accommodation that allows you to be completely incognito, with the freedom to meet new people – but only if you want to. The rooms at inBox Capsule Hotel are truly unique. Whether you decide to stay in a 6 or 16 bed (SmartBox), a single room (MonoBox) or a double room (DoubleBox) you will receive ultimate privacy. Read: overview of all different hostel room types here. There are even more cool hostels with capsule typed beds. Within each capsule there isn’t just the expected personal reading light, power socket and privacy rolling shade, but also individual ventilation and A/C – wow! It’s the details we particularly enjoy here too. 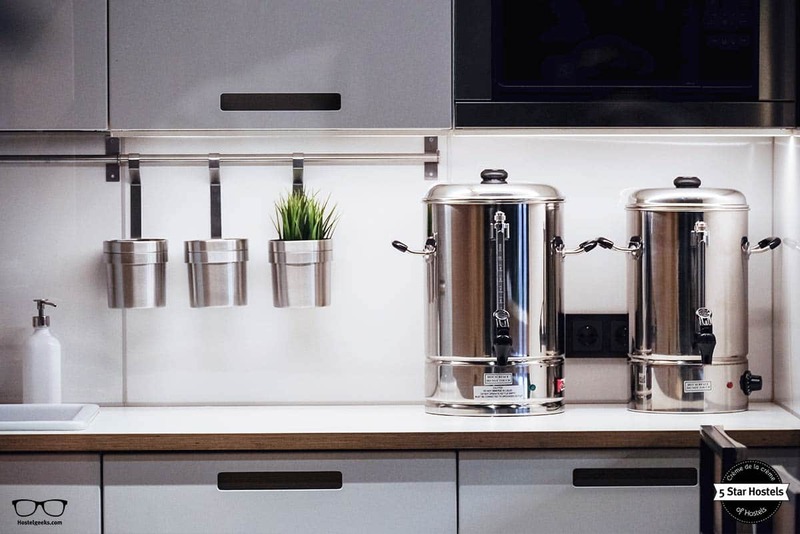 For instance, there are hangers in each capsule so you have a place to hang your towel, and a soft pocket on the wall for your personal belongings. 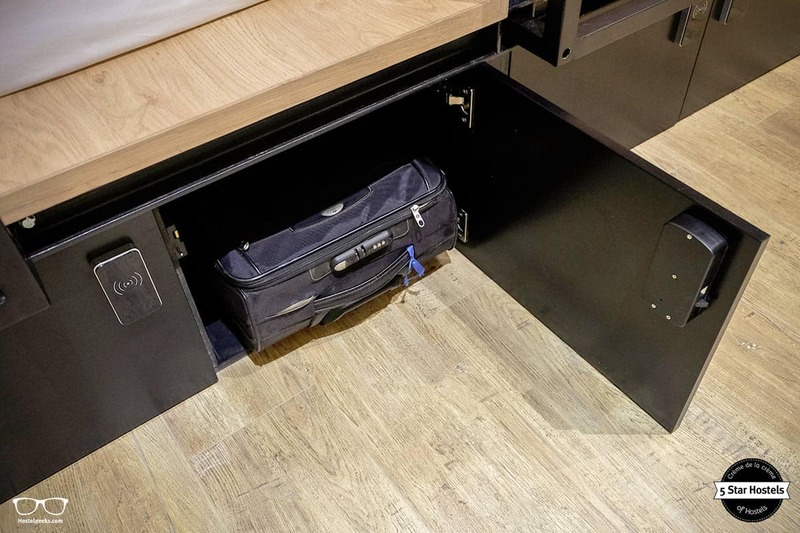 Under each bed you will find your very own locker, cleverly placed so that no room space is clogged up with stuff. Read: Are hostels safe? 13 tips for safety at hostels. If you splash out on a private double, you’ll enjoy the compact feel with nothing lost – the bathroom is on the lower level, with the capsule bedroom on top. 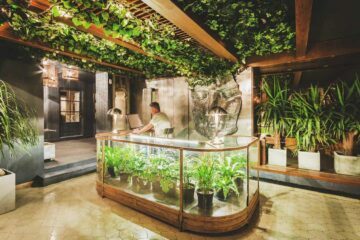 This 5 star hostel only accommodates 25 people at one time. 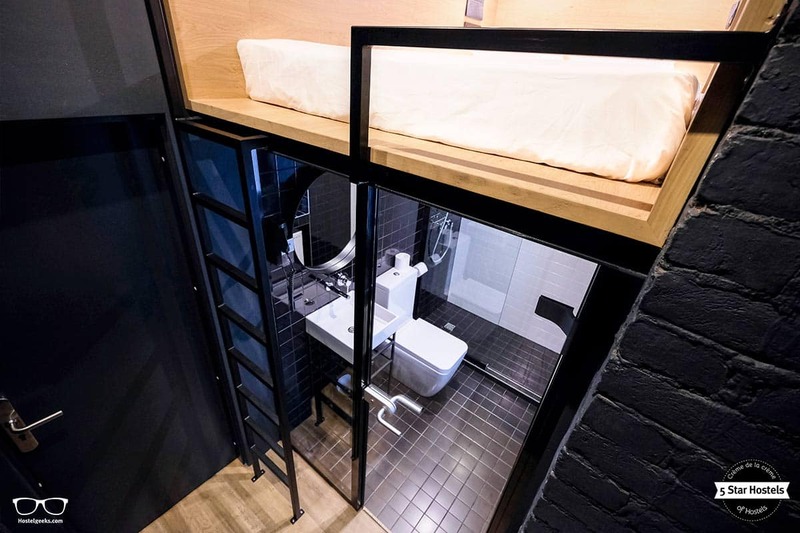 Yes it is small, but inBox Capsule Hotel stand-by it when they say it is a true benefit – you can expect a quiet, private and personal stay here. In fact, the staff at inBox call it a „hostel for introverts“. 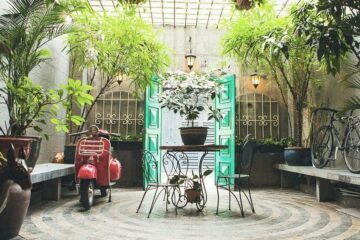 It has been mentioned a few times that the overall concept of this hostel is private. However, don’t be fooled in to thinking that this means all social vibes are avoid at inBox Capsule Hotel. 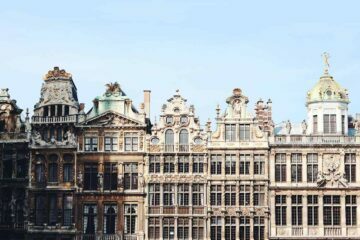 Sure, there are plenty of places to get away from the crowd and be yourself, by yourself, but there is also the option to mingle and get to know other travelers. Here is a cool list of things to do in Saint Petersburg. Give it a read and impress your fellow hostel mates. No hostel would be complete without a kitchen, especially a 5 Star Hostel. So, get on down to the cosy kitchen, equipped with a microwave oven and toaster, whilst enjoying the free tea and coffee on offer. Therefore, make sure you check out the culinary scene. You should also know there is also a free Start Pack breakfast available every morning. When you’re not enjoying the comfort of your dorm bed, switch to the comfort of the dorm sitting area. 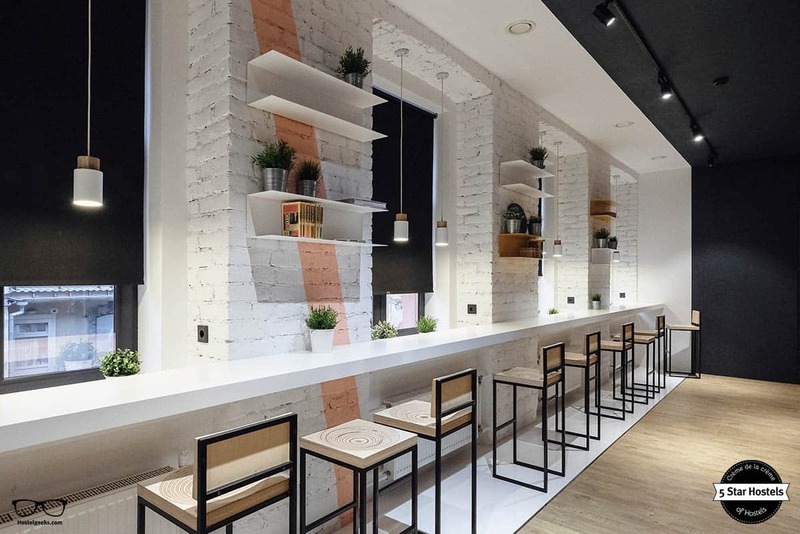 It is the perfect place to sit and let others know you’re keen to chat, and perhaps create a plan with other inBox guests to head out to Saint Petersburg together. Either that or sign yourself up for the newest hostel events. These include regular art exhibition events and ‘Five O’clock tea’ every Saturday. The perfect time to indulge in homemade baking and cookies – how can you resist? The team have been handpicked for their specialized knowledge of tourism, with over 25 years in the industry! As this is a relatively new hostel, opening its doors in June 2016, it is quite impressive to see their ratings on booking platforms. And of course none of this would be possible without the dedication and hard work of their staff. They choose and train their staff very carefully, always keeping doors open for newbie’s which can, as they say, often help to create miracles. Fancy a promo code for inBox Capsule Hotel? Who doesn't?! Now, there is no easy way to say this: Currently we do not have a valid discount for inBox Capsule Hotel. 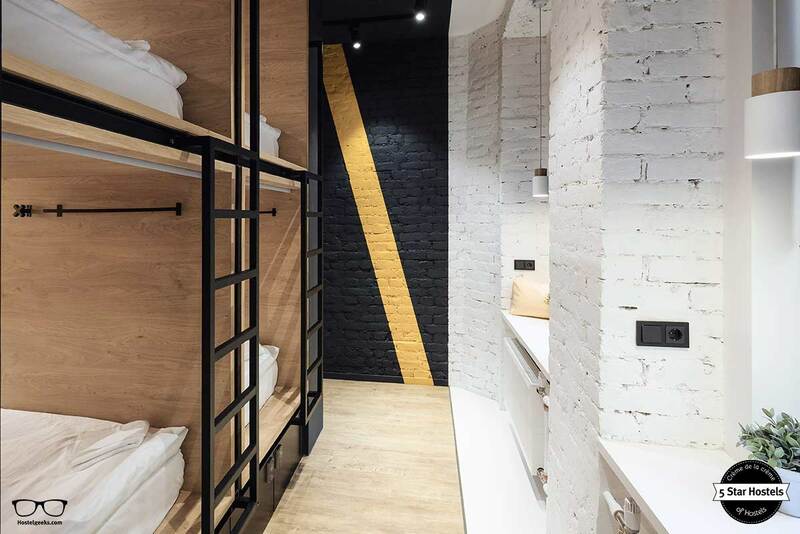 We are working on getting more promotional codes for inBox Capsule Hotel in Saint-Petersburg, Russia and all the other top hostels we reviewed for you. Check out the official website of inBox Capsule Hotel. Remember, the official website of 5 Star Hostels is the cheapest and safest place to book! 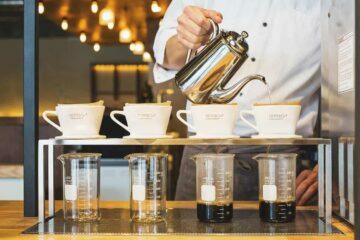 Update April, 2019: How to find flight deals to Saint-Petersburg, Russia? Still looking for cheap flights to Saint-Petersburg, Russia? We LOVE Kiwi.com. You can search here with a so-called "radius search". It is incredible easy to find sweet flight deals to Saint-Petersburg, Russia and area.